How to Avoid the Bummer Life | Health, travel, productivity and happy living. The Workshop impresses the moment you walk in by being located in an old, cool looking building. As you might expect from the name The Workshop, many people come here are to work with their laptops. This place offers lots of comfort with plentiful natural light, cool view with a central preparation area that lets you see a range of coffee making tools. The coffee here is all about the third wave. The menu includes a variety of coffee, ranging from the usual Vietnamese coffee to beans sourced from all around the world such as espresso, chemes, AeroPress. Besides that, they also have range of foods, mostly for breakfast, as well as juices and soft drinks. 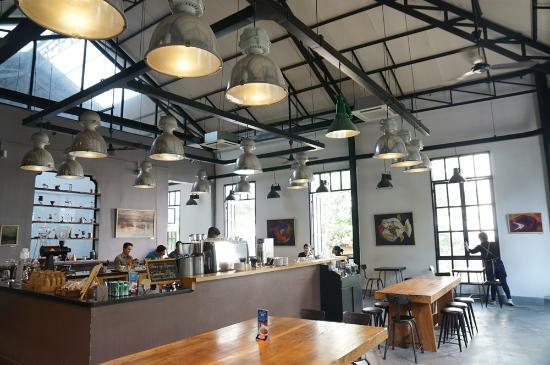 L’Usine was opened in 2010 with three parts of the main branch in Dong Khoi Street: cafe, boutique and gallery. 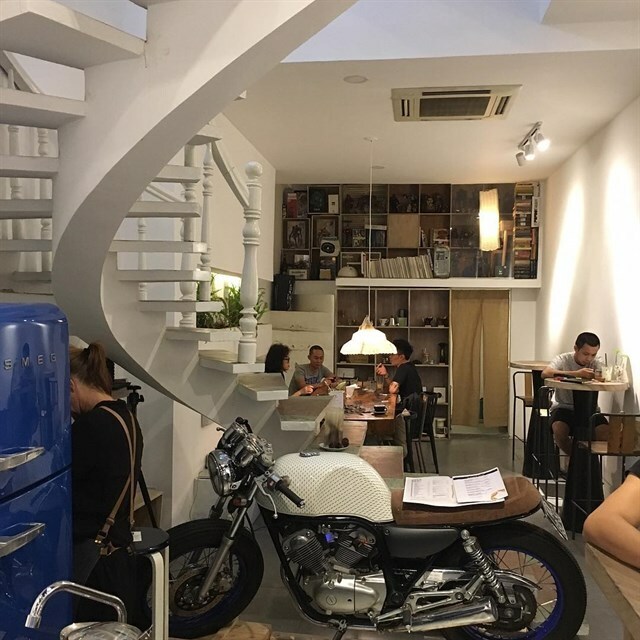 It’s a design-focused cafe with Western-Asian style decoration. A high ceiling, airy space and a vintage style will bring you a relaxing feeling here even when it’s a little busy. Most of the customers here are Western people, so the price is slightly higher than some other, more local places . The menu is varied with amazing food for breakfast and lunch. You may fall in love with the catchy names and decorations of the food or the creativeness of the way they make drinks. “Vietnam Coffee Republic” — this super Vietnamese name must remind you of a super Vietnamese style cafe and yes, it’s a cafe that’s full of Vietnamese things from the last century. If you are a traveler and want to discover more about Vietnamese culture, this cafe is definitely an ideal choice for you. This place is especially simple, as rustic and beautiful as Vietnamese’s nature. Sitting here, you can enjoy your cup of Vietnamese coffee or any kind of coffee you like, you still can feel the Vietnamese taste inside. The menu is mostly about Vietnamese coffee, with no food available. The price is fairly cheap, ranging from 28,000 VND to 50,000 VND for a cup of coffee. If you are a nature lover, if you love the feeling of breathing clean, fresh air from a garden while you’re living right in the city, Bosgaurus Coffee is a great choice for you. A high ceiling with modern and eye-catching design makes you feel relaxed and relieved. 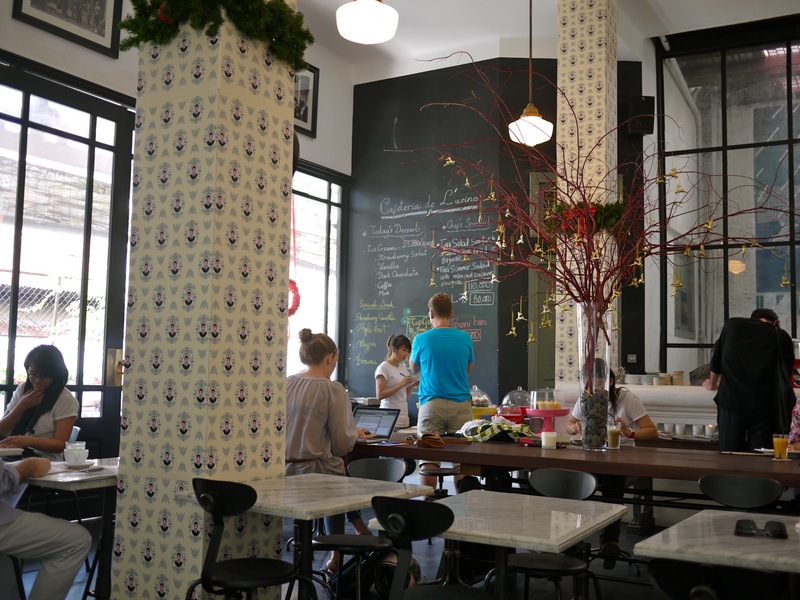 This cafe also has a prime location with views of the Saigon River. The menu is mixed with coffee, desserts and soft drinks with prices that aren’t bad. A luxurious, sophisticated and historical British kind of look is absolutely the impression you’ll feel when you first come here. This tea house is exactly same as its name: Villa Royale Antiques and Tea Room. 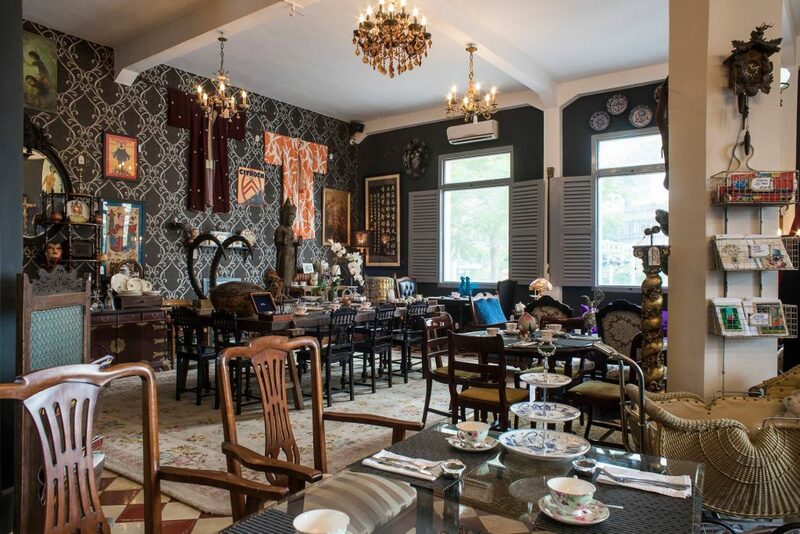 The tea room is decorated with variety of Western antiques, with a gorgeous look that makes you feel like you got lost in a magnificent construction from decades past. Besides the impressive view and decoration, the menu has many kinds of international tea that are sure to satisfy any customer. You can use your creativity to choose from a range of cake sets together with your tea. They also have menu of food options for breakfast and lunch, although these dishes are slightly overpriced. Thanks to the nice decorating and not-so-busy atmosphere, you can relax and enjoy your time here. An old, reliable favorite, Bali is one of Asia’s most versatile destinations. There’s great surfing, a massive selection of excellent beaches, world class diving, cultural activities, great nightlife… and — well, lots more. If you’re searching for a place that does everything very well, it’s hard to look past one of Asia’s most enchanting islands. Just pick somewhere other than Kuta to stay. Huh? Pattaya, of all places? What was once Thailand’s capital of all things seedy is quickly becoming one of Southeast Asia’s best seaside cities. Pattaya is now home to one of Thailand’s top hotels, the Hilton Pattaya, and boasts a variety of great resorts just outside the city. If you’re popping into Bangkok for a few days, there’s no reason not to make the short trip here. Japan’s second city, Osaka doesn’t have quite as much to offer in terms of glitz when compared to capital Tokyo, but it makes up for it with a friendly atmosphere and plenty of unique sights of its own. Just be prepared to pack a coat, since the December/January weather can get pretty darn cold. An old favorite, Singapore is one of Asia’s best destinations for people that love a smooth, clean and streamlined experience. From shopping on Orchard Road to enjoying the activities available on Sentosa Island, Singapore has something to offer for every visitor. Dubai has grown rapidly over the past two decades, transforming itself from a minor city into a global phenomenon. From Jumeirah Beach to the myriad of shopping malls, supertall buildings and incredible attractions like the spectacular Dubai Fountain, Dubai has a lot to offer as a summer (or all year, really, as it’s never cold) vacation destination. Just be aware that despite Dubai’s reputation as a place to relax, party and have fun, it’s still quite a conservative country. If you’re travelling with an unmarried partner, double check that your hotel is unmarried guest friendly before you book to avoid a frustrating experience once you arrive. A good backpack. I’m not talking about a huge “backpacking” backpack, but a backpack that’s small enough to bring on the plane as carry-on luggage. Choose something with enough interior space for a change of clothes, your tablet, a few books and your usual everyday carry — it will help out a lot for day trips and adventures. A reversible belt. Belts don’t take up much space in your suitcase, but packing them can be a major annoyance. They’re soft and take damage easily when your suitcase is bumped or knocked over, and there’s no need to pack two when you only need one. Choose a simple reversible leather belt with brown on one side and black on the other — it will look good with jeans or, if it’s a little smaller, fit in well in a formal setting. A good compact camera. A DSLR might take better quality photos, but there’s nothing more annoying than carrying around a bulky full frame camera with you. Pick a compact camera with a large sensor, like my personal favorite the Ricoh GR. Good headphones, preferably noise cancelling ones. From long flights to bus trips, having a pair of headphones and some good albums makes even the longest haul trips much more tolerable. TechRadar’s list of the best noise cancelling headphones is a good place to start your shopping efforts. A hygiene and toiletries kit. Packing your toothbrush, deodorant, medications and other essentials is much easier with a convenient kit. Amazon has a great selection of toiletry bags, most of which are priced at $20 or less. Ready to travel? Pack the five essentials listed above and you’ll be better prepared for any trip, whether you’re visiting a nearby city or spending several weeks touring an entire continent.